If one of my friends orders an ice cream flavour I was considering, even if I wasn’t dead set on getting it, I suddenly become slightly angry that they’ve ordered it because now I have to get something different (I don’t like to have the same things as other people in certain situations too). This happened in a weird way the other day when I managed to sabotage myself. It’s not even like I’ve been addicted to it or anything, it has literally taken me 5 months to eat this one, tiny jar of it. But I was just freaking out about the fact that I wouldn’t have any more. 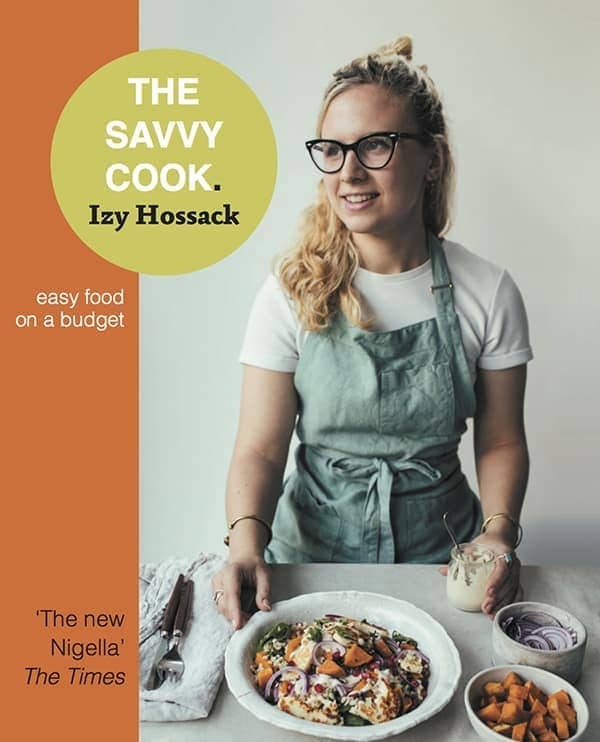 I realised I could just make some myself – but then started thinking about how many other people have a recipe for hazelnut butter on their blog. REAL TIME UPDATE: Okay a huge fly-that-I-thought-was-a-bee just flew in front of my computer screen, and I majorly jumped. Man! Talk about scary-and-a-half! Anyways, as I told you, with certain things (especially food) I don’t like to copy other people. So halfway through making hazelnut butter, I just thought ‘Well coconut is pretty tasty, I can add some in and make it a coconut butter too. Actually, I’ll even toast the coconut so there’s more coconut flavour.’ which is how the most delicious nut butter ever was made, it’s even spreadable straight from the fridge!!! 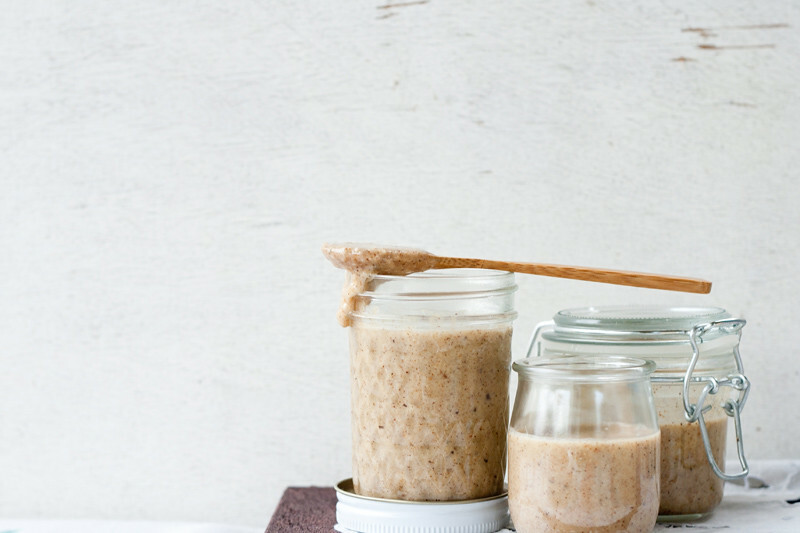 easy, delicious nut butter, no cut fingers, clean up extra fast. Hoorayyyy! Read the text below the typed recipe (after the break) to find out how! Put the coconut into a dry frying pan. Stir constantly over a medium-high heat until mostly golden brown, and fragrant (2-3 minutes). Pour straight into a small bowl. Wrap the hazelnuts in a large clean dish towel and rub together to remove (the majority of) the bitter skins. Put the coconut and skinned hazelnuts into a food processor or blender and blitz on high speed, stopping to scrape down the sides every minute or so, until liquidy and smooth (about 10 minutes). 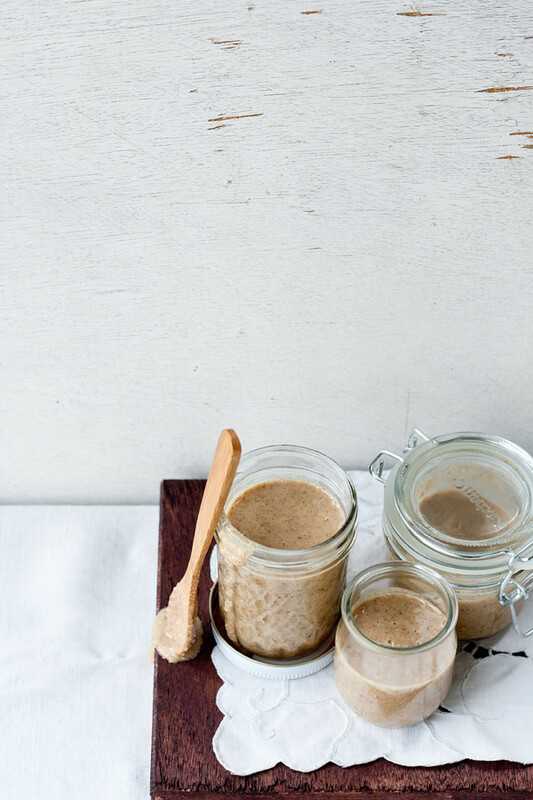 Pour the nut butter into a glass jar and seal. I like to store mine in the fridge so it doesn’t go rancid, but it takes me a while to eat an entire jar! To clean your blender, rinse it out a little with some warm water. Then pour about 1/2 cup (125 ml) of hot water into the blender, put on the lid and put it back onto the machine. Turn it on and blitz for 10 seconds (ish), pour out the water, quickly rinse once more. DONE! (also, if the water is hot enough, it should dry super fast too). Slathered on crepes-hello?! YUM……. thank you for your wonderful blog. mmmmmmm, omg yes! thanks for reading it! I pinned this recipe! I just got a new Blendtec blender and I CAN’T wait to make this in it! Oh, and guess what? I am going to make Orangette’s french toast tomorrow — this would be perfect to top it off with! Hey!!! What am I doing wrong?!? I’ve been blending in the food processor for 15mins and it’s still powder consistency. Should I add a bit of coconut oil? DEATH TRAP yes, thank you. I experienced the same irrational anger with my cookie butter and ended up making the most delicious thing (un)known to mankind, maybe next to this hazelnut coconut butter. On a tangentially related note, I also undergo a similar process of irrationality when I see somebody get on the treadmill next to me when I’m already running, in which case I end up sprinting upwards of 7 miles sometimes while gritting my teeth and cursing the fact that they are not giving up before I am. Even though they’re completely oblivious to the fact that we’re, you know, competing. Or something like that. Delicious! I was wondering how long it lasts in the fridge before it goes moldy, if you don’t do the boiling water canning thing? 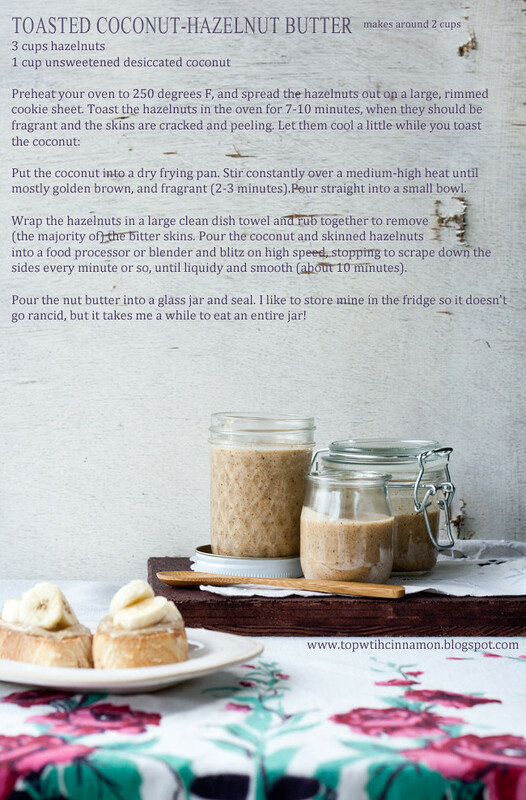 oh good lordy this sounds amazing and for the record, never seen or heard of coconut hazelnut butter before! I will try. And I know the feeling of getting mad, in your head, when you have an awesome food plan, then some one foils it. HA! HAHA, I always end up hiding nut butters at the back of the fridge 🙂 Thanks! Wow this sounds like something I have to try! Amazing, thanks! I just made this and it was AMAZING! I love to spread it on banana bread (weird, but delicious!). I added some coconut oil to it to make it more liquidy, because it was initially a bit grainy. I can’t wait to eat some more of this for breakfast tomorrow! CURRENTLY ADDICTED TO BUTTER. THANKS FOR THE INSTRUCTIONS ON HOW TO CLEAN MY BLENDER. and for how many years have I been struggling to clean my blender???!!! Perfect little hint! Grazie! A yum yum. 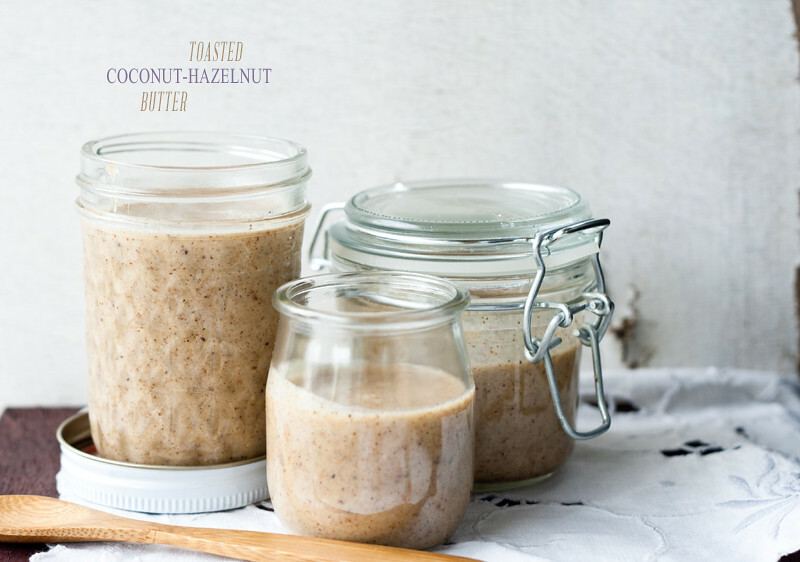 This coconut-hazelnut recipe is amazing! Thanks. THIS BLENDER IDEA IS LITERALLY THE BEST IDEA I HAVE EVER HEARD IN MY WHOLE EXISTENCE ON THIS EARTH!!!! Sometimes I’m itching to make something in my blender but I honestly can’t be bothered cleaning the huge thing afterwards. Thank you so much! Wow! 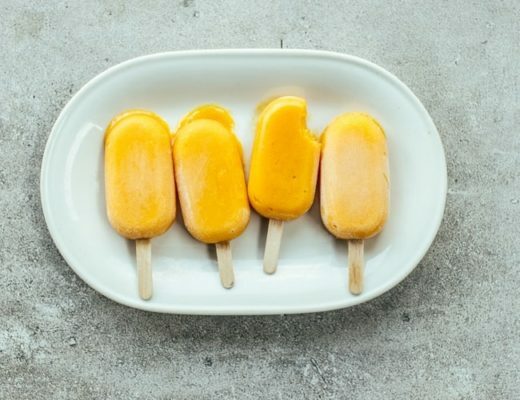 This is so interesting recipe! I had no idea that I can make coconut spread at home! Thanks a lot for the interesting recipe!